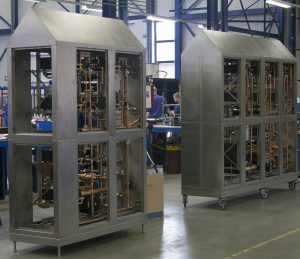 Controlsystems | Dutch Thermal Engineering n.v. 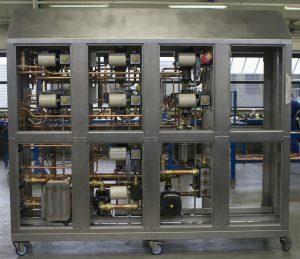 Many companies have hot and cold water available for their processes. However, the problem is that the temperature frequently fluctuates and different processes often require different temperatures. DTE developed controlsystems, the ControlMaster which are a optimal solution for these situations. The installation is fed with hot and cold water and ensures that every user, every circuit, is supplied with water at the correct temperature. The ControlMaster has a built-in pump with a mixing regulator and its own electronic controller for each individual circuit. The DTE ControlMaster enables you to cool or heat circuits extremely accurate, within a margin of 0.2K. Take your problem to our specialists, they will be happy to devise an excellent solution for you, free of obligation.